a student of photography who might want some work experience and who has knowledge of lighting and digital media. The dates will be from the 16th – 19th August, although I shall be there from the 12th. It wont be for all the hours within that day as I will be attending some conferencestoo. I have $80 a day to pay in my budget and that has to include expenses, I am not requiring any assistant to take any responsibility, just chat and general physical support. Ideally, someone who is interested in politics, war and capitalism within their practise. the political, ethical and legal aspects, is unknown and not widely discussed. that I feel is inherent and of paramount importance to my photographic practise. The exhibition features the growth and greatness of resident artists Minna Philips of Rockville, MD; Wilmer Wilson IV and Solomon Slyce of Washington, DC; and Brittany Sims of Kensington, MD. As an additional treat, the artist’s mentors are also exhibiting, so look forward to the genius of multimedia artist F. Lennox Campello, award-winning photographer Susana Raab, and co-founder of the Washington Glass School Tim Tate alongside the resident artists. Philips, Slyce, Wilson, and Sims have drawn on photography, mixed media, drawing, and painting to express each of their unique voices and contemporary perspectives. Minna Philips utilizes photographic manipulation and paradoxical recontextualization within her work – prisms, angled varieties, and shadow boxes obscure and distort what may be one’s original perception of the objects at hand. Solomon Slyce, on the other hand, brings his work to life through satirical photography of sensitive and emotionally-charged issues. He incorporates themes of interracial marriage, immigration, and financial corruption and utilizes distinctive techniques by iconic artists such as Andy Warhol, Irving Sinclair, and Grant Wood to do so. Installation artist Wilmer Wilson IV’s pieces transform the everyday into the aesthetic. Inside the Mansion, he has used more than 1,000 inflated paper bags to create a whole room-filling form, which is then later reflected in the occurrence of paper bags in his photography works. Finally, painter Brittany Sims presents her ominous paintings of worldly devastation. Drawing on images from natural disasters, her paintings inhabit unconventional shower curtain canvases that give her experiments true shape and dimension. Also included in the exhibition are two multimedia works marrying drawing with video by F. Lennox Campello, a photographic series embodying literature by Susana Raab, and a new Tim Tate mixed-media sculpture incorporating blown and fused glass, electronics, and video. So if you are in the environs, the opening is this Friday from 7-9 pm. 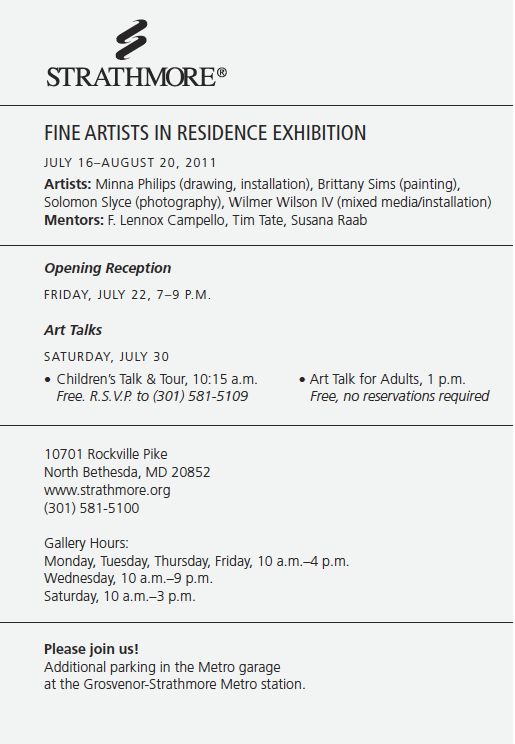 For more information, visit www.strathmore.org or call (301) 581-5100.